Life and loss: Seemingly paradoxical words that reflect the dark and the light, the pain and the joy; the vibrancy and the despair. 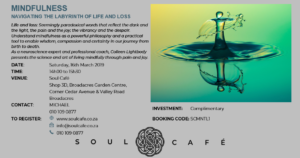 Understand mindfulness as a powerful philosophy and a practical tool to enable wisdom, compassion and certainty in our journey from birth to death. As a neuroscience expert and professional coach, Colleen Lightbody presents the science and art of living mindfully through pain and joy.